Ms. Ranjitha (Alumnae of Computer Science & Engineering Department, 2017 Batch), Consultant & Application Developer, Thought works, ACR Mansion Koramangala, Bengaluru, started the session with solid principles on object oriented programming , She explained how the principles of object oriented programming is inculcated for building and running programs in corporate companies. Then she continued the talk by carrying with hands on session for students by teaching them to write simple programs related to object oriented programming with C++ and java and how to code the simple applications programs with C++ and java. This talk was helpful for students to gain knowledge how programming is done using C++ and java. Also gave a broad idea on coding the application related programs. Finally the session was brought to an end with questionnaires and discussions on practical aspects of implementing object oriented programming and java. Alumnae Association of GSSS Institute of Engineering & Technology for Women (GSSSIETW),Mysuru organized a Talk on “Awareness on Opportunities in Ethical Hacking” by the Alumnae for Final Year in-house project students of CSE on 12th February 2019. The program was graced by Ms Ruchika (2017 Batch Alumnae of Computer Science Engineering Department), Hands on educator, Kidvento Education Research, Mysuru. Ms. Ruchika (2017 Batch Alumnae of Computer Science Engineering Department), Hands on educator,Kidvento Education Research, Mysuru, started the session with importance of the Cyber security and ethical hacking, she explained basic tools of ethical hacking- Kali Operating system, Metaspoilt, Wireshark, etc. This talk was helpful for students to carry out final year projects and also gave a broad idea in ethical hacking domain. She suggested to utilize the opportunities and expertise in at least any one of the professional course. Finally the session was brought to an end with questionnaires and discussions on practical aspects of implementing in-house projects. Alumnae Association of GSSS Institute of Engineering & Technology for Women (GSSSIETW),Mysuru organized a Talk on “Awareness on CCNA Certification Course” by the Alumnae for Pre Final Year Students of ECE,TCE, CSE and ISE students on 9th February 2019. The program was graced by Ms. Jannavi (2010 Batch Alumnae of Information Science Engineering Department), Network Engineer, V5 Techsol, Bengaluru. Ms. Jannavi Network Engineer, V5 Techsol, Bengaluru, started the session with importance of the CCNA Certification course, opportunities after the CCNA Course, job roles in the Networking Sectors and she explained the contents of the course and the recognized institutions that provide the training program. She suggested to utilize the opportunities and expertise in atleast any one of the professional course. The self confidence, leadership qualities are more essential in today’s world. Finally the session was brought to an end with questionnaires. The session was helpful for the students to get placed in the Networking sectors. Finally the session was brought to an end with questionnaires. The session was helpful for the students to become a successful engineer. The second session was conducted by Ms. Akshara Kumar, Truly Essential, Mysuru. She suggested the students to improving the communication skills, presentation skills, leadership qualities and taking the advice from the resource persons and improving yourself everday and share her experience in all the stages to became a successful entrepreneur. Finally the session was brought to an end with questionnaires. The session was helpful for the students to become a successful entrepreneur. Alumnae Association of GSSS Institute of Engineering & Technology for Women (GSSSIETW),Mysuru organized a Technical Talk on “Top Five Emerging Techniques in IT Industry and Challenges in a Corporate Field” on 18th August 2018 held for Pre-final year students of ECE,CSE,ISE,EEE,TCE,EIE Branches The program was graced by Mrs. Amulya (2010 Batch Alumnae of CSE Dept.) , Senior Associate Software Engineer, GENPACT Engg. Head Strong Capital Markets All Alumnae Coordinators of all the departments, Students and staff members were present in the session. The session was conducted by Mrs. Amulya, Senior Associate Software Engineer, GENPACT Engg. Session was started with the importance of upcoming technologies like Artificial intelligence, IOT, Cloud computing, HTML, Block chain and Java to get into the corporate world she suggested to improve the communication skills, presentation skills, leadership qualities and self confidence which are more are more essential in today’s world. Finally the session was brought to an end with questionnaires. The talk was helpful for the students to expose them to the new technologies and innovative ideas. From left side Dr. M Shivakumar, Principal, GSSSIETW, Chief Guest Smt. Mouna Monnappa Sr. Commercial Promoter American Express, Muscat and Academic Governing Council member GSSSIETW Mrs. Archana B, Secretary, Alumnae Association, Alumnae of Various Departments. GSSS Institute of Engineering & Technology for Women (GSSSIETW), Mysuru, had organized the 5th Alumnae Meet on 19th May 2018 in the Seminar Hall of GSSSIETW. The chief guest for the event was Smt. Mouna Monnappa Sr. Commercial Promoter American Express, Muscat, Academic Governing Council member GSSSIETW, Mysuru. Alumnae working in different organizations attended the meet and shared their memories during this event. During this Occasion the Sanitary Napkin Vending Machine Sponsored by Alumnae Association GSSSIETW was inaugurated by Chief Guest Smt. Mouna Monnappa, Sr. Commercial Promoter American Express, Muscat, Academic Governing Council member GSSSIETW, Mysuru and Dr. M Shivakumar. Principal GSSSIETW, Mysuru. The chief Guest Smt. Mouna Monnappa shared her memories, as a student in the College and motivated the young women engineers to take up challenges in the society and serve the nation. She also enlightened the students about the social responsibilities. Smt. Soumya Dath G, Alumnae Coordinator read out report on alumnae activities held during 2017-18., Anil Kumar P V Head – Training & Placement, Department Placement and Training, highlighted the Placement statistics of the College and the importance of maintaining a bridge between the alumnae and the College. Events were conducted for alumnae as a part of the alumnae meet; alumnae participated actively and enjoyed the occasion. GSSS Institute of Engineering and Technology for Women (GSSSIETW), Mysuru in association with IEEE Student Chapter Region 10 (Bangalore) and GSSSIETW Alumnae Association had organized Mini Project Symposium -2018 on 24th Feb 2018 at Seminar Hall, (GSSSIETW), Mysuru. Dr.Shivakumar M, Principal, GSSSIETW,Mysuru and Mini Project Symposium-2018 coordinator Dr. Prameshachari B D, Prof. & HOD, Dept of TCE, Alumnae of all the departments from various Companies, HOD’s of various Department, Project Coordinators, Faculty members and Final year Students were present. The Chief Guest for the function Mr. Venkatesh Murthy, Executive Director, Engineering, Velankani Software Pvt. Ltd, Bangalore highlighted the importance of project ideas which make meaningful steps towards the welfare of the society. He appreciated the initiative taken by the institute, which provided students a platform to exhibit their technical skills, work with team and explore themselves towards the niche trends of their respective fields. He gave an overview of expectation of the industry from the engineering students emphasizing of the fundamental skill required for an engineering graduate to be employable, which is provided by GSSSIETW, Mysuru. Dr.Shivakumar M, Principal, GSSSIETW,Mysuru gave concluding remarks about Mini Project Symposium-2018, he addressed that, This is a significant learning experience stressing teamwork, organization, and communication which are the important elements in an engineering career. Mini Project symposium showcases the results of individual and team-based efforts to solve multidisciplinary technical challenges. He also thanked the Alumnae for being part of the event and asked them to share their professional experiences and challenges with their juniours. Alumnae were directed to meet Principal Dr. Shivakumar M, and the HOD’s of various departments. The discussion went on regarding the role of alumnae in the growth of Department and the Institution and finally they were made to interact with Prof. Anil Kumar P V,Head – Training & Placement, GSSSIETW, Mysuru, for extending support for the placement department . The inaugural function was followed by paper presentations as a part of symposium based on mini project work completed during 7th semester. The judges for this event were alumni of the college. Alumnae of respective department working in various companies evaluated the mini project symposium papers. Session concluded with the distribution of merit and participation certificates. IEEE Student chapter Region 10 certified the best paper presenter. (Sitting from left): middle Person Dr. Sumithra Devi K A, Principal, GSSSIETW, followed by Alumnae of Various Departments from different Companies and the Alumnae association coordinators, GSSSIETW, Mysuru. Alumnae were directed to meet Principal Dr. Sumithra Devi K A, CEO Sri. R K Bharath and the discussion went on regarding the role of alumnae in the growth of Department and the Institution and finally they were made to interact with Prof. Anil Kumar P V,Head – Training & Placement, GSSSIETW, Mysuru, for extending support for the placement department . Alumnae from different batches addressed the Final year students and gave the importance of the “Career and future opportunities” ,“Enhanced Employability Skills” and “Adaptability to Industry”Alumnae shared their experiences and conducted activities to give an insight into how IT organizations work. Pallavi N(2003 Batch Student) , Senior Testing Engineer in Larsen & Toubro Technology Services, Mysore. CSE Department: Amulya S(2010 Batch Student), Senior Associate Engineer in Genpact Headstrong Capital Market. Vinayashree(2009 Batch Student), Chip designer in Whizchip Technology, Bangalore. Mrs.Ashwini B(2009 Batch Student), Senior Technical Reviewer in Set view technology,Mysuru. Madhuri Bhat (2011 Batch Student), Software Engineer in Accenture, Bengaluru. Sonali Kashyap(2011 Batch Student), Data analyst in Goldman Sachs Company. Vaishnavi D R(2014 Batch Student), Software Engineer in IBM, Bangalore. Felciya(2011 Batch Student), Assistant Manager in Tata class edge. Uma J(2007 Batch Student), Assistant Professor, Dept. of Electronics, MMK & SDM Mahila Maha Vidyalaya, Mysuru. Any achievements in the Current working place. Details about the Higher studies( if Pursuing). Any Competitive exams( if appeared and success of that). For the above information kindly attach suitable documents and mention your Department name and Batch. Alumnae wing of GSSS® rendered an donation of Rs. 10,000/- towards the “Karunamayee“, Special children Training School Mysuru on 23rd March 2017 at Auditorium, GSSSIETW. (From left): Smt. Vanaja B Pandit, Hon. Secretary, GSSS®; Founder of “Karunamayee“; Children’s from “Karunamayee“ performing on Geethayaana. The GSSSIETW Alumnae association “ Geetha Sangama” rendered a donation of Rs.10000/- towards the “Karunamayee“, Special children Training School, #1, Near Subba Rao Park, 1st Stage, Niveditha Nagara, Mysuru on 23rd March 2017. GSSSIETW is a supporting hand for these kinds of social activities. It also has been a role model for the society towards being a helping hand for the needy in society. (Sitting from left): Middle row second: Mrs. Archana B, Secretary, Alumnae Association; Chief Guest Ms. Pruthvi M J, Deputy Superintendent of Police, Bengaluru; Dr. Sumithra Devi K A, Principal, GSSSIETW; Mrs. Usha Rani, Treasurer, Alumnae Association; (Standing): Alumnae of Various Departments. GSSS Institute of Engineering & Technology for Women (GSSSIETW), Mysuru, had organized the fourth Alumnae Meet-2017 on 13th May 2017 in the Seminar Hall, GSSSIETW. The chief guest for the event was Ms. Pruthvi M J, Deputy Superintendent of Police, Bengaluru (Alumnae, 2004 batch, EEE Dept). Fifty Alumnae from working in different organizations attended the meet and shared their memories in the College campus. The chief Guest Ms. Pruthvi M J in her talk shared her memories, as a student in the College and guided the students to prepare for Civil Service Examinations for better prospects. She also motivated the young women engineers to take up Civil Service Exams and serve the nation. She also enlightened the students about the social responsibilities of every citizen. Institutional achievements were briefed by Dr. Sumithra Devi K A, Principal, GSSSIETW, Mysuru. Smt. Archana B, Secretary, Alumnae Association read out report on alumnae activities held during 2016-17. Sri Chowdri K K, Head, Department Placement and Training, highlighted the Placement statistics of the College and the importance of maintaining a bridge between the alumnae and the College. Events were conducted for alumnae as a part of the alumnae meet; alumnae participated actively and enjoyed the occasion. GSSS Institute of Engineering & Technology for Women (GSSSIETW), Mysuru, had organized the Third Alumnae Meet-2016 on 14th May 2016 at Seminar Hall, GSSSIETW. Twenty Alumnae from different Companies attended the Meet and shared their memories in the college campus. The institutional achievements was briefed out by Dr. Sumithra Devi K A, Principal, GSSSIETW, Mysuru. Smt Archana B, Alumni Association Secretary read out the report on Alumnae Activities 2015-16. Sri Arasu M T, Placement and Training Officer spoke about the Placement statistics and the importance of maintaining a bridge between the alumnae and the college. The Meet was followed by Mini-Project Presentations by Pre-final year students in their respective Departments in which the students presented technical projects based on their Mini Projects. The judges for this event were the alumnae of the college. Session concluded with the interactive events for the Alumnae. (Sitting From left): Dr. Bellappa S, Professor & Head Dept. of Chemistry; Dr. Shivakumar M, Professor & Head Dept. of E&I; Dr. M.V Sathyanarayana, Professor & Head Dept. of E&C; Sri Rajagopala R, Associate Professor & Head Dept. of E&E; Dr. Sumithra Devi. K.A, Principal, GSSSIETW, Mysuru; Sri Arasu M T, Placement and Training Officer; Dr. Dayanand, Associate Professor & Head Dept. of CSE; Dr. Reshma Banu, Associate Professor & Head Dept. of ISE; Dr. Parameshachari B.D, Associate Professor & Head Dept. of TCE; Dr. Pushpalatha H.L, Professor & Head Dept. 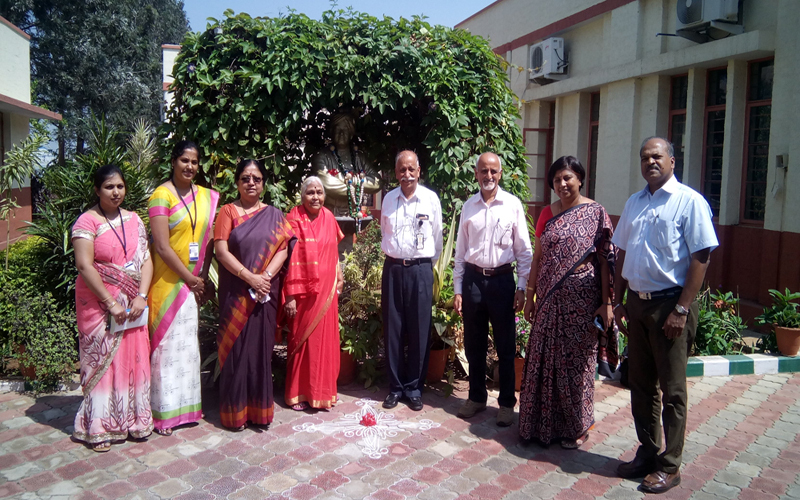 of Physics; Sri Krishna B, Librarian; Standing: Alumnae of Various Departments. The Alumni Association of GSSS Institute of Engineering & Technology for Women (GSSSIETW), Mysuru, organized an Alumnae meeting followed by “Alumnae Symposium-2015” on 12th September 2015 at 2.00 pm in Seminar Hall in the presence of Incharge principal Dr. M V Satyanarayan, Professor & Head, Dept. of ECE. The event was started by welcoming all the alumini’s for the symposium by Smt Archana B, Asst professor, Dept. of ECE. Few interactive events were organized for alumnae and prizes were distributed. The Gathered Alumnae shared their views and experiences. The session was continued by Mrs ARCHANA MURALIDHAR ,Global Technologies ,Mysuru who enlightened the students of EDC about women entrepreneurship, and also explained the stages of becoming successful entrepreneur. Followed by this the last session was continued by the Ms Rukmani S V, Pratham, Mysuru, who explained the roles and duties of NGO Volunteer and presented a small review about rural child education, health and how do the NGO help the rural child education and ended up with an interaction with the NSS Students. “Geethasangama” an Alumni wing of GSSS® rendered an donation of Rs. 25,000/- towards the Shubodaya Charitable trust” Mysuru on 09.11.2015. The Shubodaya Charitable trust requested the fund for the production of “The Voice Book” CD for the 10th and PUC physically challenged students. The CD comprises of text books, syllabus content, teaching by various teaching experts and along with that music acoustic background. GSSSIETW is a supporting hand for these kinds of social activities. It also been a role model for the society towards being an helping hand for the needy in society. The fund rendered of Rs. 25,000/- Smt.Vanaja B Pandit, Hon. Secretary, GSSS® towards Shubodaya charitable trust and received by Dr. D. Balaji Manager, Shubodaya Charitable Trust, Mysuru. “Geethasangama” an Alumni wing of GSSS® rendered as donation of Rs. 25,000/- towards the “Swami Vivekananda Youth Movement” Mysuru on 14.12.2015. The Swami Vivekananda Youth Movement, Palliative Care team requested the fund for the patients from marginalized families suffering from chronic terminal illness. GSSSIETW is a supporting hand for these kinds of social activities. It also has been a role model for the society towards being helping hand for the needy in society. The fund rendered of Rs. 25,000/- Smt. Vanaja B Pandit, Hon. Secretary, GSSS® towards Swami Vivekananda Youth Movement and received by Dr. R Balasubramaniam, Founder and President, Palliative Care, Vivekananda Youth Movement, Mysuru. GSSS Institute of Engineering and Technology for women conducted First Alumnae function “Connect Today” recently in the presence of a large number of alumnae working in various companies like Thought works, IBM, Wipro, Infosys, Tech Mahindra, L & T, SPI, Excel soft, Sysco, HCL, Unilog solutions, BEML, Rangson’s Electronics and many more. A look at the alumnae of GSSSIEW from the year 2003-2013. GSSS Institute of Engineering and Technology for women conducted First Alumnae function “Connect Today” recently. The function was presided by Smt. Vanaja B Pandit, Honarary Secretary, GSSS (R) and the Chief Guest was Sri C. V. Gopinath, Former Sr. DDG and Ex-Officio Addl. Secretary, Govt. of India. A large number of alumnae working in various companies like Thought works, IBM, Wipro, Infosys, Tech Mahindra, L & T, SPI, Excel soft, Sysco, HCL, Unilog solutions, BEML, Rangson’s Electronics and many more are participated in the function. GSSS first Alumnae meet conducted was on 12/04/14. The function was presided by Smt. Vanaja B Pandit, Honarary Secretary, GSSS (R) and the Chief Guest was Sri C. V. Gopinath, Former Sr. DDG and Ex-Officio Addl. Secretary, Govt. of India. More than hundred Alumnae working and also pursuing post graduation are participated in the function. The participated Alumnae are working in different companies like Thought works, IBM, Wipro, Infosys, Tech Mahindra, L & T, SPI, Excel soft, Sysco, HCL, Unilog solutions, Beml, Rangson’s Electronics and many more. A brain storming session was conducted where Alumnae day, plans for future, project works, guest lecture, industrial visit have been discussed. From the discussions, the Alumnae day has been fixed on second Saturday of May every year. The Alumnae those who have missed this wonderful function are requested to attend the next meet.